Vitas has been doing well to keep their place in the upper half of the table, as they won 8 matches and drew the other 6. They play very compact football and always try to win possession back from the opponent in the midfield. Leonid Slutsky set his troops in a way that their attacking players can play freely up front. It has taken away the burden of defensive duties and can concentrate on scoring goals, as they managed to score 33 goals this season. Green-White Army is one of the weakest teams in this year’s Eredivisie, as they lost 11 games. The forward line has not been consistent enough for them to win matches, scoring 1.16 goals per game. Danny Buijs’s men play a very physical and aggressive game. Defending set pieces and winning aerial dual is the strength they possess. Individual errors and the absence of good center-back pairing in the defensive third has cost them valuable points. Vitesse lead 3-1 in the last 5 matches in all competitions. FC Groningen leads 2-1 in the last 5 meetings at Euroborg. 1-1 scoreline has reoccurred twice in the last 4 meetings. FC Groningen last won a match in this tie in 2017. 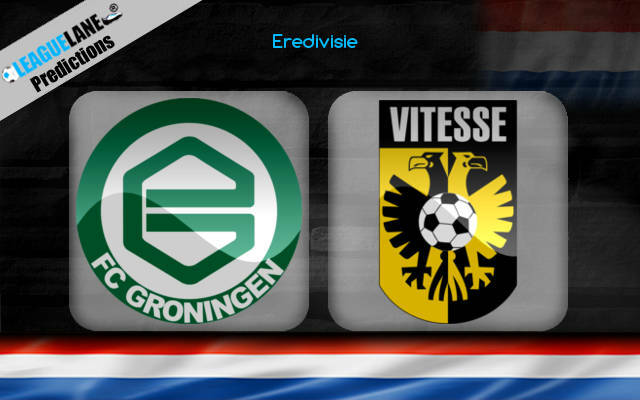 Vitesse will be on front foot from the start of this match, as they are eager to keep their place in the top half of the table. The away side got quality up front and can easily breach their opponent defense. Vitas will be playing more freely and will score goals. The previous meetings between these two sides turned out to be goal-scoring encounters. The match will be open for both these teams and will get a couple of chances to ripple the goal net. I strongly believe both teams will mark their name on the score sheet.